Growing up, Mom and Dad made sure every visitor felt welcome in our home with a (proverbial or actual) warm and welcoming embrace. And our cultural, religious and family traditions had to follow suit. My parents never cared much for tradition that didn’t honor everyone, engender both joy and remembrance and welcome the stranger. I remember, at one Passover years and years ago, a relatively new friend of Mom (she made friends every day, even in the elevator or on a City bus) came over for her first Passover seder and brought something that she had made and . . . WAIT FOR IT, WAIT . . . It was a shock to all of us that someone would make something homemade (especially to my mother) because, after all, we lived in New York City. SIDEBAR: No one “cooked” except for Mrs. Travers (of blessed memory) who made the same cherry Jello mold with fruit since the early 1960s. Don’t laugh because it became so “groovy retro” in the 1990s. So my mother was charmed and mortified all at once. Still, what to do about the noodles? Without missing a beat, my mother put the noodle dish on the Passover table. As everyone sat down, she thanked her friend for bringing it and advised those observing the Passover dietary restrictions that this was not a dish for them. Just as it is written that, each of us was liberated from the land of Egypt and we eat the Hillel sandwich of the matzah and maror signifying the bitterness of slavery and other symbolic foods, the Blogger family ate the matzah, maror and some pasta and veggies, in observance of our tradition and our parents’ rules about joy and welcoming the stranger in our house. Fast forward twenty or more years to Dad’s Shiva. Ok, “Shiva” was only one night, so it doesn’t even meet the requirements of the name, Shiva. And, a female rabbi who looked about 11 years old led the service. My brother beckons me to the kitchen. SIDEBAR: It has taken many years but I think that my brother and I are in a good place. I know we love each other. And, I have a deep admiration and respect for him. And, he is just so adorable and handsome and funny. A 12-YEAR OLD FEMALE RABBI LEADING MINYAN. TRUMP THANKING MY FATHER FOR HIS SERVICE TO OUR COUNTRY [see earlier post]. MOM. DAD. PASSOVER SO MANY YEARS AGO. THE LOVE OF A BROTHER WHO DIDN’T WANT HIS SISTER’S BIRTHDAY TO GET LOST IN REMEMBRANCE OF DAD’S LIFE WELL-LIVED. So, when we thought “the coast was clear” and some of SOB’s friends were still around, out came the birthday cake, with candles and everything. And, courtesy of BOB and his family, there was joy for us three kids amid the sadness. And we bent the traditions so far back that they almost broke in two — but not quite. And Mom and Dad smiled down. They were proud. And the three of us? We would not have done a thing differently. This weekend, I saw my dear friend who has cancer. SIDEBAR: I would say, “had,” but I am too superstitious. There is still radiation, to eradicate any stray cells. This weekend, the stars aligned. She finished chemo; I am healthy; and she has a break before radiation therapy to make sure the “big guns” got it all. I drove to the suburbs of Boston. I was early, so I parked a street away and let my thoughts run wild — through the fears of what chemo had done to her body; through the fervent belief that my friend would be there, just as she always was, although maybe a little paler, a little weaker, and little less hair; through everything in between. I waited 30 minutes, and still I was early. I couldn’t wait anymore. I pulled up to the house. Her husband and I hugged. Very soon afterward, my friend comes down the stairs. Thinner. With a head scarf. But, same smile. Same beautiful eyes. My friend. An indomnitable spirit and with a certain grace that even poison cannot kill. Letty Pogrebin’s article about her friend’s fight with cancer prepared me for the difference in my friend’s appearance. I knew to focus on the windows to my friend’s essence — her smile and her eyes. And then she took off her scarf and showed me that her hair was growing back. I ran my hands over the short growth. It was good to feel softness. The regrowth process started gently. I was glad to think that recovery might be as gentle and kind from here on out. And she is beautiful without hair. And she was relaxed and happy to laugh and recount some of the crazy, Seinfeld-like, stories of various people’s reactions. And eager to listen about the crazy stuff in my life and in Soeur J’s life. Soeur J lives not too far and rearranged her schedule to match mine (thank you). We had a fun, funny visit. But it was too soon time to go. I told my friend not to wait for me to pull away because I had to input GPS coordinates back to Boston. In truth, I needed to let the tears stream down. Tears? Of gratitude that my friend survived chemo. Of gratitude for her and Soeur J’s friendship. Of gratitude that I, a healthy person, and my friend could look each other in the eyes and be grateful for the moment, the years of friendship, and an abiding love. Radiation starts on Wednesday. Keep my friend in your thoughts and prayers. POB has never really embraced this blog. She has grown accustomed to it, as one does a dull pain in the neck. Sometimes, she is afraid of what I will write; I seem to have a more inclusive sense of what is an appropriately bloggable moment. It is a boundary thing: I have few (for better or for worse) and POB has a few more (for better or for worse). SIDEBAR: Even I have boundaries. Some of the Soeurs were shocked to hear that there is such a thing as an unbloggable moment. Yes, there are life moments too intimate, too painful, too sad, to share. And there are moments that can’t be shared yet. Why? Well, dear POB, for the simple reason that I may not be there to correct you. If you write it, it is real. 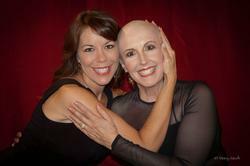 Below is Letty Pogrebin with her friend, who lost her hair to chemotherapy. I don’t know these women, but I see something in Letty’s friend that we rarely see in anyone — the drive to live. I have a dear friend who is battling cancer. She recently had her beautiful black hair (no gray) cut off because it was falling out in clumps. She was scared to look in the mirror. I haven’t seen my friend without her hair, but I expect she looks beautiful. Just as Letty’s friend is beautiful. Because, when I look at my friend, I won’t see her lack of hair. I will see her love of life and family and a resolve to live. Even with horrible treatments that would test anyone’s will. I used to think, if I had cancer, I would just let it run its course. I would not go to extraordinary lengths and live in misery for months on end, just for the possibility of a cure. I would die young and leave lots of life insurance for my family. But I see my friend now. And my plan is not so easy anymore. I see that she needs to live for her husband, her children, her parents and, yes, us, her friends for 30+ years. My friend is fighting hard and her friends are fighting mad that this happened. And despite the anger and despair of standing by helplessly, my friend inspires me to love life even though I am not facing an existential threat. I look at my friend and, all of a sudden, my aging body is not a tragedy of lost youth but proof of life and my vessel into the ensuing years. If I am so lucky. And, through my friend, I learned that my clever plan was just plain selfish. I need to live for my family, my friends and all those I love. And I need to live for me and the joys (and pain) that come with every day on this earth. To my dear friend: You are beautiful and the power of your life force resonates hundreds of miles to me here in New York and, in possibly the most perverse twist, gives me strength when I should be shouldering some of your burden. Sidebar: I promised that my blog entry today would be more upbeat than these last few weeks (ok, months). The COB, being a kind and gentle sort, was really disturbed by my decidedly gloomy (read: depressing as hell) blog entries, and took to heart my pledge to write less about death and aging and navel-gazing. “Don’t Sob, Dear Cob” — a potential winner, except my sister is SOB and that could be confusing. “The Cob Gets His Head Bobbed” — my brother is BOB and he is a peaceful man. 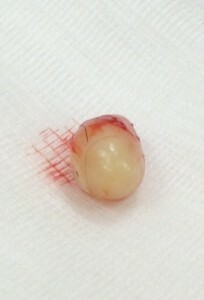 “Corn off the Cob” — when you see what was removed, this doesn’t do it justice. Using “Blob” was ok because I determined that that acronym would not go over well for anyone and so there would be no risk of confusion. The COB walked into my office one day, closed the door and sat down in a guest chair, all with an air of something important to say. “You know that thing on my head?” he started. “What thing?” as if I didn’t know. Wait, wait, wait, wait, wait. What’s wrong with my ears? Still, it is about him and his thing and, showing uncharacteristic restraint and selflessness, I let that slide. For now. So, based on the tone of the email, I knew all was ok. Based on the picture, I realized that it wasn’t really a thing; it was a gross thing. I emailed him: “We have broken the grossness barrier in our friendship. It looks to be about 15% of your brain. How is the other 85% doing?” Based on the grossness factor of his email, I am thinking that his intelligence was heavily weighted in that 15%. “That could be another good title for the blog! !” he emailed back. Dear COB, I adore you so. The elevator had a smell that SOS could not identify. It was, however, immediately obvious to POB. And I am not talking body odor. “Mommy, what is that smell?” A teachable moment arrives. “Huh?” [Ok, this parenting thing is getting harder.] “It smells awful.” The elevator opened to our floor. “Eeewwwww. I was inhaling drugs???? ?” he asked in horror. Worry over. Moment forgotten. Back to play and carefree late afternoons after camp. A missed teachable moment about that urban legend, “contact high,” to keep our son even farther away from smoking dope. I hope he reads this blog entry when he is 15 years old and using cheesy aftershave and chewing gum to try to cover his tracks as he squeaks in just under curfew while I am pacing in the foyer.